Released on GM Recordings, produced by Gunther Schuller. 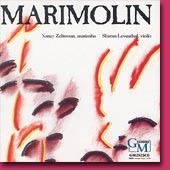 Marimolin's debut album was enormously well-received. Includes Robert Aldridge's "Threedance," Thomas Oboe Lee's "Marimolin," and Lyle Mays' "Somewhere in Maine." One of the most stylistically well-balanced, downright entertaining collections of contemporary classical music released in recent years.